The introduction of the Goods and Services Tax (GST) represented a significant change to Canada’s system of taxation, was well as a major source of debate in Canadian politics. This article provides an introduction to the GST, which includes an overview of its operation, a review of its political history, and a summary of key debates on the GST. What is the Goods and Services Tax? Taxation is a mechanism used by all levels of government in Canada to collect revenue in order to finance government programs and services. Taxation is a compulsory payment imposed on individuals, businesses, organizations, and property. Personal Income Tax: Both the federal and provincial/territorial governments impose annual personal income taxes on individuals, which represent the largest portion of government revenues. Generally speaking, income tax is a charge on an individual’s annual income or the amount of money they have earned over the course of the year. This would include such things as wages, capital gains (income earned from selling a personal asset, such as real estate and stocks), and subsidies (such as welfare and unemployment assistance). Corporate Tax: Federal and provincial governments also collect annual corporate or business taxes, which is a charge on the earnings and capital of businesses. Earnings are generally considered gross revenues less expenses; in other words, companies only pay taxes on their profits, rather than on the total amount of money they collect on the sale of their products. Property Tax: This is a tax on property, usually real estate, owned by individuals and businesses. Under this type of tax, people usually pay an annual sum equal to a certain percentage of the value of their property. Property taxes are commonly found at the municipal level of government in Canada. Sales Tax: Another common form of taxation in Canada is sales tax, which is a charge on the exchange of goods and/or services between individuals and organizations. When one party sells a good or service to another party, a sales tax must be paid to the government. The Goods and Services Tax (GST), as well as the various provincial sales taxes, are examples of this sort of taxation. The GST is a sales tax, meaning that it is a charge on the exchange (or “sale”) of goods and services between individuals, business, and organizations. As a sales tax, there are several basic elements that characterize the GST. First, the GST is a consumption sales tax, meaning that the party purchasing the product (the consumer) is responsible for paying the tax, as opposed to the “seller” of the product. If you purchase a book from a bookstore, for example, you (as the consumer) are charged the GST in that particular transaction. This principle operates at all stages of production and distribution. Whenever a transaction occurs, be it at the manufacturing, distribution or retail stage, the party purchasing the good or service is required to pay the GST. Second, the GST is a percentage consumption tax, meaning that the amount of tax you pay is based on a certain percentage of the sale cost (before taxes) of the good or service you have purchased. As of June 2007, the GST was a six percent tax; meaning that consumers were required to pay a tax of six percent of the sale cost of the good or service they purchased. If, for example, the book you purchased cost $10, then the GST on that purchase would be six percent of $10 (or $0.60). The total cost of the book, including taxes, would be $10.60. Third, the consumer pays the GST, while the seller or vendor is responsible for collecting and remitting the GST to the government. The consumer who purchases the book pays the GST to the bookstore and the bookstore remits it to the government at a later date. Over the course of the tax year, vendors in Canada are responsible for keeping track of how much GST they have collected and then sending that amount to the government. The GST is a special sort of sales tax, commonly referred to as a value-added sales tax. This type is distinctive in that it only taxes the monetary value added to a product at different stages of the production process. This is significant in that it overcomes the problem of cascading taxation that can plague other sorts of sales tax. What exactly is cascading taxation? Consider a sales tax that is applied whenever a good or service exchanges hands. As such, a situation would occur in which the tax is applied multiple times in a product’s life. Take, for example, a television. Firstly, the television must be made by a manufacturer, whom purchases a number of inputs during the production process, such as raw materials and equipment. In purchasing these inputs, the manufacturer must pay a sales tax. This process continues through the wholesaling and retail stages. When a wholesaler purchases the television from the manufacturer, they have to pay tax in that transaction. When the retailer purchases the television from the wholesaler, another tax charge is applied. Finally, when you purchase the television from your local retailer, you again are charged a tax. This layering of sales tax can significantly increase the final sales price of a good or service, as each party in the cycle (manufacturer, wholesaler, and retailer) must increase the price of the product to recoup the tax they paid. Making matters even worse, tax is being paid on tax. If, for example, a manufacturer pays $1.00 in tax when producing their product, then they have to recoup that cost by increasing their sale price to retailers by $1.00. When the wholesaler pays their tax on the manufacturer’s sale price, therefore, they have to pay tax on a price that includes the prior $1.00 sales tax charge. This process of paying tax on tax is repeated when the retailer purchases the product from the wholesaler, and again when the final consumer purchases it from the retailer. Value-added taxes, such as the GST, overcome this problem of cascading taxation through a system of Input Tax Credits. Under this system, sellers or vendors of goods and services are provided with tax credits equaling the amount of GST they paid during their normal business. Manufacturers, for example, receives a tax credit for all the GST they paid when purchasing inputs in the manufacturing process. Wholesalers and retailers, similarly, receive tax credits for all the GST they paid when purchasing their stock. The only group that does not receive a tax credit is the final consumer, who purchases the product for consumption as opposed to using it as input for production or distribution. As a result of this Input Tax Credit, there is no layering of GST. Manufacturers, for example, are able to recoup the GST they paid in the production process through the system of Input Tax Credits. As such, they are not forced to increase the price of their product when selling to wholesalers. Similarly, wholesalers do not need to increase their price when selling to retailers, or retailers when selling to the final consumer. The GST is applied to most goods and services exchanging hands between individuals, businesses, and organizations. However, some things are excluded (or partially excluded) from the GST’s application. These exclusions usually involve goods and services that governments desire to keep cheaper for lower-income individuals and families. There are two types of GST exclusions: tax-free and tax-exempt. “Tax-free” exclusions include goods and services where no GST is assessed throughout the life of the product. Final consumers are not charged GST when they purchase these products from distributors. Moreover, vendors are entitled to Input Tax Credits at the production and distribution stages. As a result, the good or service is completely free taxation, at least with respect to the GST. Examples of tax-free exclusions include basic groceries, prescription drugs, and medical devices. “Tax-exempt” exclusions include goods and services where the GST is charged at the production and distribution stages, but not at the final retail stage. In other words, final consumers of products are not charged GST on their purchases. Manufacturers, wholesalers, and retailers, however, are assessed GST in their production and distribution of the good or service, and are prohibited from claiming an Input Tax Credit. As such, some GST is embedded in the final price of the good or service; however, it is lower than it would otherwise be under the regular GST regime. Examples of tax-exempt exclusions include residential rents, health and dental care, and educational services. Finally, lower-income individuals and families are entitled to some GST relief on goods and services that are normally taxed under the GST. These people can claim a refundable tax credit on some of the GST they paid over the course of the year. This tax credit is given to people when they submit their personal income taxes, and is based on their annual earnings. Those with lower incomes are entitled to a GST rebate, while those with higher incomes are not. The Goods and Services Tax replaced the Manufacturer’s Sales Tax (MST), which was first introduced in 1924. What was the MST and why was it replaced by the GST? The MST was a single-stage sales tax generally applied to the manufacturer’s sales price of goods produced in Canada and to the customs value of goods imported into Canada. Wholesalers and retailers would pay the tax when they purchased goods produced in Canada or internationally to sell to consumers. The MST scheme was criticized for several reasons. Opponents to the tax argued that it often lead to a cascading of taxation. In some cases, manufacturers were required to pay MST when purchasing inputs for their product, such as equipment and materials; these inputs were manufactured products and hence, were open to a MST charge. As a result, wholesalers and retailers were required to pay MST on prices for manufactured goods which already contained MST in them. They were, in effect, paying MST on MST. Opponents were also critical of the MST’s narrow tax base. As a single stage sales tax applied only to the manufacturer’s sales price of goods and services, the MST did not tax the value added to products by wholesalers and retailers. The MST base was further narrowed by legislated exemptions granted to a wide range of consumer goods, such as food products, books, magazines, health products, heating fuels, clothing, and most machinery and equipment. These criticisms of the MST led the federal government to initiate several reviews of the tax, which yielded different strategies on the issue of sales tax reform. In 1956, the Sales Tax Review Committee recommended reforming the MST so that it would be applied at the wholesale, rather than the manufacturer, level. The MST would be charged by wholesalers when they sold the product to retailers or individual consumers, and, as such, would be based on the higher wholesale sale price (as opposed to the lower manufacturer’s sale price). The benefit would be a broadening of the MST’s tax base and higher tax revenues. In 1966, the Royal Commission on Taxation produced its findings on the issue of sales taxes in Canada. The Commission agreed that a tax on wholesale transactions would be an improvement over a tax at the manufacturing level, but argued that a retail tax would be even more beneficial, as it would apply to a broader tax base that would include services. The Commission proposed that the federal and provincial governments implement a national sales tax that the provinces would be responsible for collecting. This would allow the federal and provincial governments to adopt a common tax base for their sales taxes. In 1983, the Liberal federal government created the Federal Sales Tax Review Committee, which concluded that neither an improved manufacturer’s tax nor a wholesale tax was the solution. Instead, the Committee gave the federal government three options to consider: 1) a national retail sales tax, 2) a federal retail sales tax, or 3) a federal value-added tax. The Committee pushed for the third option, suggesting the federal government collaborate with the provinces in administering the tax. In the end, however, no action was taken by the federal government throughout this period. Inaction was based on the difficulties of implementing a new sales tax system to replace the MST. On the one hand, there were concerns that the government could not properly administer and collect a sales tax at the wholesale or retail level. Moreover, in regard to a national sales tax, gaining provincial cooperation in administration and collection was considered a major obstacle. In the late 1980s, the federal government, led by Progressive Conservative Prime Minister Brian Mulroney, again pursed the issue of sales tax reform, announcing its desire to replace the MST with a new value-added sales tax called the Goods and Services Tax (GST). Moreover, the federal government intended the new GST to be a nationally harmonized sales tax. The tax would replace individual provincial sales taxes (PST), and both levels of government would share the revenues generated. Subsequent negotiations to harmonize the provincial and national sales taxes proved unsuccessful. Some provinces even challenged the introduction of national sales tax, arguing that the federal government was exceeding its constitutional powers by operating in a taxation field historically reserved for the provinces. As a result, in 1989 the federal government announced it would proceed to implement the national sales tax without the cooperation of the provinces. In 1990, however, Quebec signed an agreement with the federal government that transferred full responsibility for administration of the GST (in Quebec) to the province. The Quebec Sales Tax (QST) was introduced in the province in January 1991. At the same time, the federal government introduced the Goods and Services Tax in the remainder of the country, and repealed the old Manufacturer’s Sales Tax. With the exception of Quebec, the GST was introduced as separate and additional to provincial sales taxes, meaning that consumers were required to pay two sales taxes on their purchases. When it was first instituted in 1991, the GST’s rate of taxation was set at seven percent, meaning that consumers were charged a tax of seven percent of the price of the good or service they were purchasing. See the What is the Goods and Services Tax? section of this article for more information on the operation of the GST. While initially the federal government was unable to harmonize the GST with provincial sales taxes (except in Quebec), more recently some provinces cooperated. In 1996, the federal government, under Liberal Prime Minister Jean Chrétien, combined the GST with the provincial sales taxes in Newfoundland and Labrador, Nova Scotia, and New Brunswick to create the Harmonized Sales Tax (HST). The harmonized tax, which went into effect on April 1, 1997, is collected federally by the Canada Revenue Agency. Once collected, the appropriate amount is then remitted to the provinces. Ultimately, the harmonization of the provincial and federal sales taxes does not affect the costs of goods and services for consumers: harmonization did not change the amounts of the taxes, only how they were collected by the federal and provincial governments. As of June 2007, the HST has not been extended outside of those three Atlantic Provinces. The very notion of the GST sparked instant controversy across the country. Much of the controversy centred on perceptions the GST was tax grab by government, and that it would be a regressive form of taxation, meaning that it would hit lower-income individuals and families harder than wealthier ones. The opposition parties in Parliament attacked the Mulroney government’s proposal for the GST, as did two Progressive Conservative Members of Parliament, David Kilgour and Alex Kindy, who voted against the bill and were later expelled from the PC caucus. Nevertheless, Prime Minister Mulroney was able to pass the GST through the Progressive Conservative-dominated House of Commons. The GST, however, had a more difficult time in the Liberal-dominated Senate (made up of 52 Liberals, 46 Tories, one Reform Party member, and five independents). The Senate must approve any money bill, such as the introduction of a new tax, for it to become law. It is generally customary, however, for the appointed Senate to support legislation passed by the elected House of Commons (either as is or with only minor modifications). In the case of the GST, however, the Senate bucked custom, deciding instead to hold up the new tax’s passage. To ensure the federal government’s bill got through the Senate, Prime Minister Brian Mulroney invoked Section 26 of the Constitution Act, 1867. This obscure section allows for the addition of four or eight Senate seats, at the discretion of the Queen. Her Majesty Queen Elizabeth II approved the appointments, increasing the number of senators to 112, from 104. In turn, Prime Minister Mulroney filled the new vacancies; the Progressive Conservatives suddenly enjoyed an instant majority in the Senate with 54 members, meaning the controversial legislation would have enough votes to pass. In protest, Liberal Senators launched a two-month filibuster — defined as the use of tactics, used most often by Opposition members in a parliamentary body, to delay or prevent a vote by time-consuming talk — further delaying passage of the legislation. Ultimately, they failed to halt the bill and its progress. The GST came into effect January 1, 1991. As part of its pre-election campaign in 1993, the Liberal Party of Canada released its Red Book — a document that spelled out what a Liberal government would do once elected. One of the Party’s key pledges was to replace the GST “with a system that generates equivalent revenues, is fairer to consumers and to small business, and promotes federal-provincial fiscal cooperation and harmonization.” In that election, the Liberals won a majority government, electing 177 members to the House of Commons on October 25th. Once in office, however, the Liberal government failed to deliver on its election promise. Part of the issue was the federal government’s difficult financial position, with its high annual deficits and accumulating debt load. Moreover, the GST had become an important source of government revenues, totaling in the tens of billions annually. The Liberal government decided to keep the GST, a decision that posed some political difficulties. Liberal Member of Parliament John Nunziata voted against his government’s first budget in protest and was later expelled from the Liberal caucus for doing so. Liberal MP Sheila Copps, then Deputy Minister and Minister of the Environment, had vowed to give up her seat if the Liberals did not eliminate the GST. In 1996, she honoured her pledge and resigned from Parliament, only to be re-elected in a subsequent by-election for her riding. The GST again became an important political issue in the 2006 federal election. The Conservative Party, led by Stephen Harper, promised to reduce taxes by lowering the GST from seven to six percent. 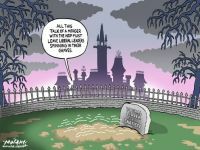 The incumbent Liberals, in contrast, supported keeping the GST at seven percent, and lowering income taxes instead. Following the election, the new Conservative government included the GST cut in its first budget; the reduction came into effect in July 2006. The reduction of the GST has received both support and criticism. On the one hand, consumers benefit from the lower GST, as the cost of purchasing goods and services has decreased, albeit by a small amount. Consumers, therefore, should be able to purchase more with their money. Some critics, however, have regarded the tax cut unfavourably, arguing that it makes little real difference to the average Canadian. They also suggest that, if the Conservative government is serious about lower Canadian tax burdens, the focus should be on reducing personal income taxes and not sales taxes. Others have suggested that the reduction in GST is an unfair tax cut, as it benefits higher-income individuals and families more than lower-income ones. Their basic premise is that actual savings depends on how much one spends to begin with; accordingly, those that spend more on goods and services will save more money, in absolute terms, than those that spend less.